Agritourism "Grynwald" is located near the Świętokrzyskie Mountains. This location allows quick access to the most important tourist attractions in the Świętokrzyskie Mountains. The attractive location of our agrotourism close to the Chańcza recreational lagoon creates optimal conditions for recreation. Agrotourism provides comfortable and cheap accommodation in rooms: 2-, 3-, 4-, 5-rooms with bathrooms. Accommodations in our agritourism guesthouse, 50 accommodates guests in 15 rooms with bathrooms. Our agritourism is located on the 5-hectare, entirely fenced, forested area. In the agritourism guest can spend their time safely and enjoy the various forms of recreation. The guesthouse meets the requirements set out in the provisions on fire protection. Would you like to provide long-lasting impressions to your employee during the trip to the Integration Event? 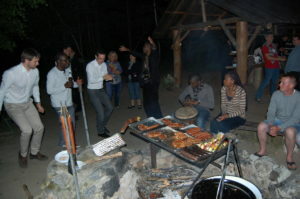 You want a company trip to combine both comfortable accommodation, a good party and a good one recreation ? center agrotouristic "Grynwald" for an integration event is an ideal solution. 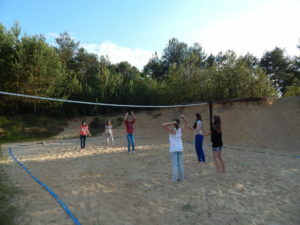 You can organize fantastic games and integrative games with us: Integrating grilling, playing football, playing beach ball, paintball in the real wartime frontage (numerous trenches, hills, river beds, forest), playing disc golf, organizing dancing in the 80 meter salon with sound system and disco lighting. For other games and games according to your wishes, too there will be plenty of places. Agrotouristic pension "Grynwald", located in The forest has a large space that perfectly blends in with any integration scenario. Measuring football pitch, sandy pitch to volleyball, and the only one in the region of the Świętokrzyskie Mountains Golf disc games these are just some of our attractions shared with a participant in Integration Events. We know from experience that great joy for the participants is also the ability to move freely around the forest and collect available mushrooms. The entire 5 hectare area is fenced and covered with pine trees. Everyday fun and integration-friendly evenings can be arranged at roof shelters - grill. When the weather is not too easy, you can also organize party time in the living room by the fireplacein the Bordeaux Hall. We serve in a separate dining room healthy and tasty food. A large parking lot will allow free parking of the bus or cars. Do you want to deliver interesting impressions to your group of children or young people during their trip to the green school? You would like the trip to combine both tourist attractions (historical, geographic) as well as good recreation? the "Grynwald" center for a green school is an ideal solution. With us you have the opportunity to organize fantastic integration activities both for girls and boys. 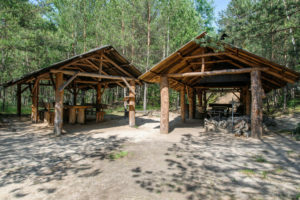 The agrotouristic center "Grynwald", located on the edge of the Cisowsko-Orłowiński Landscape Park near Raków, is an excellent starting point for trips to the Świętokrzyskie Mountains during everyday trips. 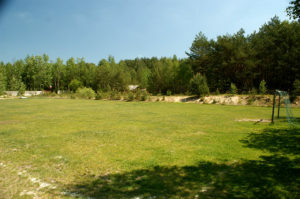 Big football pitch, sandy playground volleyball, and the only one in the region of the Świętokrzyskie Mountains Golf disc games these are just some of our attractions provided by the green school. We know from experience that great joy for children is also the possibility of free and at the same time safe exploration of the beautiful 5 hectare forest around agritourism. The whole area is fenced and covered with pine trees. The north-western part of the center occupies Sand Canyonin which children and teenagers love to play safely. Everyday fun and integration-friendly evenings can be arranged at covered shelters - grill. A professional table is also available in table tennis. We serve in a separate dining room healthy and tasty food. A large parking lot will allow free parking of the bus. Agritourism pension "Grynwald" together with all the facilities guarantees you a pleasant and active time in the middle of a pine forest. Diversity around green space favors the organization of various games and activities for both children and adults. The agritourism center, forest, comfortable rooms, delicious food and a healthy microclimate will ensure the perfect rest and regeneration of all participants. What must you see in Kielce?